A 13-year-old girl was placed with child protective services after police discovered her at a Guangzhou airport impersonating a flight attendant on August 21. 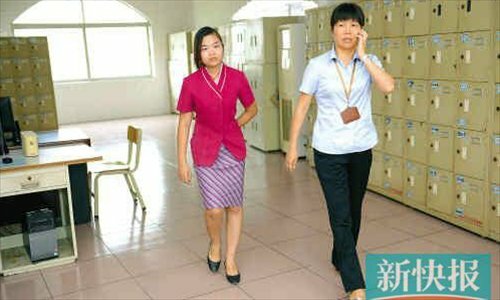 Police explain Luo Siqi was spotted at Guangzhou Baiyun International Airport dressed as a China Southern Airlines stewardess over several days, reported local news site xkb.com.cn on September 9. Luo was caught by airport authorities similarly dressed 16 days before, said the report. "I love the blue sky and I always dreamt of flying. I wanted to stay at the airport so I could be close to my dream," Luo told authorities between sobs. The girl was also found with official documents from the airline. Luo told police she had bought four stewardess uniforms online. According to a social worker handling the case, Luo was raised in an orphanage before she was placed in the care of an elderly couple. After her foster parents were sent to a nursing home, Luo was left with a relative in eastern Guangdong Province. Unhappy with her new living arrangement, Luo traveled to Guangzhou in July on her own. Child care officials returned Luo to her relative on August 13 following her first run in with airport police.